Chicago offers your dog some of the most pet-friendly places available. 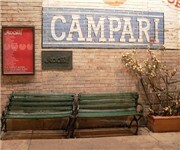 From upscale shopping, eating and sleeping, Chicago is a great place to bring your best friend. 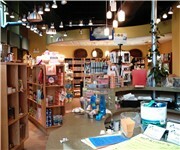 Kriser's - Chicago, IL - "Kriser's was conceived out of a passion for pets and concern for their sustained health. Our mission has been to create a store that sells only the highest-quality, all-natural, petsafe foods and products... all made by industry top standards, free of chemicals, additives and preservatives. Shoppers can be confident that human-grade ingredients will be found in all Kriser's stocked products, so they can choose from all we offer knowing every selection results in only the best for your pet. Kriser's is a place of nutrition, information, and education." Off the Leash Pet Boutique - Chicago, IL - Full-service pet shop sells grooming products, human-grade pet food, leashes, collars, toys, brushes and more; dog wash on the premises. For Dogs Sake - Chicago, IL - A selection of cushy beds, toys and wheeled carriers is also available. Spoil your pet with a rhinestone-studded collar or the mood-ring collar that changes colors accordingly. A tray of canine cookies tempts from atop the checkout counter. Zane & Zara's Pet Boutique - Chicago, IL - A full service boutique for the discerning dog or cat offering all natural and/or organic foods, simple yet elegant clothing pieces for being well dressed, fine doggy bedding and much much more. 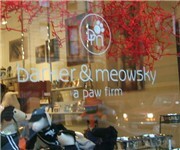 Barker & Meowsky - Chicago, IL - Barker & Meowsky a paw firm, is a distinctive pet boutique that offers stylish products for you and the pets you love. With the latest styles in pet couture it's no wonder that dogs and cats of all shapes and sizes paws to browse whenever they get a chance. They carry a huge selection of exclusive dog apparel, beds, collars, harnesses, leads, cat furniture and pet carriers and can help you find the perfect product to match your personal style or even your home’s décor. Wigglyville - Chicago, IL - "Since 2005, Wigglyville has been providing leading products and health information in its Chicago neighborhood. Our mission is unwavering. We remain extremely selective about the products we sell, choosing quality for the health of your furry kid, sturdiness for longevity of use, and eco-friendly to sustain world resources. All of our products are selected with one thing in mind; integrating our furry kids into a positive lifestyle which promotes their health and well-being." Chicago passed a "Dog Friendly Dining" ordinance effective in 2008. To allow dogs in their outdoor dining areas, restaurants must purchase a Supplement License for Dog Friendly Areas. There are rules and regulations which the restaurants must follow in order to allow dogs and dogs are not allowed to be petted or handled by staff members or fed while at the restaurant. Dogs must have a city license and proof of vaccinations. Scoozi - Chicago, IL - Scoozi is a dog freindly restaurant located in the lively River North Art Gallery District, this sprawling Italian Trattoria is a grand atmosphere in which to enjoy traditional Tuscan antipasti, pizzas, pastas and seasonal authentic fare. Pauline's - Chicago, IL - Pauline's serves fresh, quality food in generous portions. "We try to provide attentive service in a clean, upbeat and friendly environment." Pauline's is a dog friendly Chicago restaurant. Uncommon Ground - Chicago, IL - Uncommon Ground features a full menu, live music every night, bar, and art gallery. Since 1991, Uncommon Ground has been Chicago's most-loved coffeehouse and acoustic venue. The cafe hosts monthly showings of local artists' work, all of which is for sale. During the warmer months, dogs can join their owners on the sidewalk cafe and enjoy free water and dog biscuits. Gallery Cafe - Chicago, IL - Gallery Café roasts all of our fresh and flavorful international coffee beans in-house, including Fair Trade, Hawaiian Kona and Jamaican Blue. You’ll also love our specialty drinks, tea, milkshakes, malts and smoothies. Spice yours up with vanilla, chocolate, cinnamon, or nutmeg. Come by and enjoy the summer outdoor café, a gallery of work form local artist, free dog treats, and free Wi-Fi. Joe's Sports Bar - Chicago, IL - Joe's Sports Bar is has a pet friendly patio! Joe's is a 20,000 square foot warehouse-style venue located near Lincoln Park in Chicago. Joe's specializes in sports, live music and private parties. Joe's features five party rooms including a large outdoor patio. Each room offers its own unique environment. Brasserie Jo - Chicago, IL - Chicago's only authentic French brasserie and winner of the 1996 James Beard Award for Best New Restaurant of the Year, Brasserie JO is a fun and flavorful tribute to the casual eating and drinking places of Chef Joho's homeland, Alsace, France. Its assertively seasoned classic brasserie food is as Alsatian accented as the ebullient Chef Joho himself. The Terrace Café at Brasserie JO offers a dog friendly dining experience. Grant Park Dog Friendly Area - Chicago, IL - The Chicago Park District's goal is to provide the people of Chicago the opportunity for recreation and to enjoy outdoor open space for themselves and their families. The Park District also recognizes that dogs are important family members and value the need to provide a space for recreation for them as well. 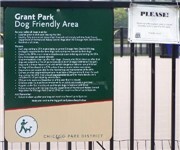 The Grant Park Dog Friendly Area is located west of Columbus Drive and south of the tennis courts just south of Balbo. The park sits directly behind the Chicago Park District’s 9th Street service yard. Puptown Park - Chicago, IL - Puptown is a Chicago Dog Friendly Area (DFA) where dogs can run and play off-leash. Located in Margate Park, in the Uptown neighborhood, Puptown features 16,230 square feet of fully enclosed fun. Winnemac Park - Chicago, IL - There are shifts of dog owners and dog lovers that bring their pups to Winnemac throughout the day. Winnemac's highlights include a large, outdoor space with 4 baseball diamonds, paved and meandering trails throughout, a few wild-growth areas of seclusion with pathways to explore, and a very nice off leash dog run. Hamlin Dog Park - Chicago, IL - Hamlin Park is a full city block long and wide and boasts four full-size, lighted baseball diamonds as well as a kiddie park. There's an great dog friendly bark park that is off leash as well. Wicker Park Dog Area - Chicago, IL - Wicker Park is located Northwest of Chicago's Loop. Both dog haters and dog lovers are satisfied with the fenced dog area at the East edge of the park. This is one of a number of official off-leash areas in the city for dogs. The Montrose Dog Beach - Chicago, IL - Montrose Dog Beach is the only place in Chicago where a dog is allowed off the leash and take advantage of it. You and your four footed friend will have a great time in the water at Montrose Dog Beach and if your dog can be handled without a leash, all the better, but make sure he or she will come when called. Allegro Chicago Kimpton Hotel - Chicago, IL - Hotel Allegro Chicago is a pet-friendly hotel and we would love for you to bring your A-List celebrity with you. From the special attention at check-in to our pet-friendly packages and our surrounding area's pet-friendly environment, our downtown Chicago hotel is a perfect setting. Pets need to get away and enjoy a little pampering too. Bring yours with you—Hotel Allegro is a pet-friendly hotel. Hotel Monaco Chicago - Chicago, IL - The boutique Hotel Monaco in downtown Chicago takes care of all its guests in style, including our four-legged friends, taking the term pet-friendly to a new level. Pets need to get away and enjoy a little pampering too. Bring yours with you—Hotel Monaco is a pet-friendly hotel. Sofitel Chicago Water Tower - Chicago, IL - Sofitel Chicago Water Tower bids you welcome with world-class downtown Chicago hotel accommodations - minutes from the Magnificent Mile, Michigan Avenue, the Museum of Contemporary Art, the Art Institute, and trendy boutiques. Designed by the French architect Jean-Paul Viguier, our downtown Chicago Illinois hotel is a 32-floor prism of glass, boasting 415 rooms, including 33 luxurious suites. 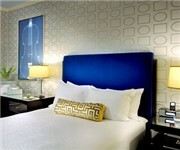 Embrace modern design and rich architectural legacy at this luxury hotel in downtown Chicago, Illinois. Dog-friendly amenities include pet grooming, aromatherapy services, and complimentary treats. Hotel Burnham Kimpton Hotel - Chicago, IL - For people who like to bring their dog along, Hotel Burnham's Pet-Friendly program is legendary. They offer a warm welcome to pets all over the country, making it easy and fun to have them with you. Really. If you're happier and more comfortable traveling with your pet, you're welcome at every Kimpton Hotel. The Palmer House Hilton - Chicago, IL - The Palmer House Hilton is dog friendly. Pets less than 75lbs are welcome in guest rooms for an additional per stay fee.